↑ Reiher legally changed his surname to Snuka. ↑ Jimmy Snuka's reigns occurred while the promotion was a National Wrestling Alliance affiliate named Eastern Championship Wrestling, and was prior to the promotion becoming Extreme Championship Wrestling and the title being declared a world title by ECW. ↑ "WWE Hall of Famer Jimmy Snuka Dead At 73 WWE Legend Jimmy Snuka Dead at 73". TMZ. 15 January 2017. สืบค้นเมื่อ 13 May 2017. 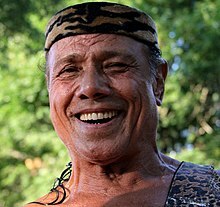 ↑ 2.0 2.1 2.2 2.3 2.4 2.5 2.6 2.7 ""Superfly" Jimmy Snuka bio". WWE. Archived from the original on July 17, 2015. สืบค้นเมื่อ September 3, 2015. ↑ 3.0 3.1 3.2 Meltzer, Dave (1996). The Wrestling Observer's Who's Who in Pro Wrestling. Wrestling Observer. pp. 111–112. ↑ 4.0 4.1 "Historical Dictionary of Wrestling". Scarecrow Press. 2014. p. 272. ↑ Shields, Brian (2010). Main Event: WWE in the Raging 80s. Simon & Schuster. p. 51. ISBN 1416532579. ↑ Mooneyham, Mike (January 20, 2013). "Superfly Jimmy Snuka soars again in new book". The Post and Courier. สืบค้นเมื่อ August 6, 2015. ↑ "Snookered by internet "sources"". Under the Ring. สืบค้นเมื่อ 2007-08-09. ↑ "CWA British Commonwealth Championship". CageMatch.net. สืบค้นเมื่อ August 8, 2015. ↑ "List of CAC Award Winners". Cauliflower Alley Club. สืบค้นเมื่อ August 6, 2015. ↑ 12.0 12.1 12.2 12.3 12.4 Slagle, Steve. "Jimmy "Superfly" Snuka". The Professional Wrestling Hall of Fame. สืบค้นเมื่อ August 6, 2015. ↑ "Title Histories". East Coast Pro Wrestling. สืบค้นเมื่อ 2015-08-10. ↑ Hoops, Brian (July 6, 2015). "On this day in pro wrestling history (July 6): Terry Gordy & Jimmy Snuka win belts, Santana vs. Valentine, Goldberg vs. Hogan seta WCW record". Figure Four Wrestling. สืบค้นเมื่อ 2015-08-10. ↑ "Five new Champions are Crowned at Wrestlefest 2002!". IWSwrestling.net. June 2002. Archived from the original on August 3, 2002. ↑ "Mid-Atlantic Tag Team Title". Mid-Atlantic Gateway. Archived from the original on 2011-05-17. สืบค้นเมื่อ 2015-08-13. ↑ "WCW World Tag Team Championship History (1980–2000)". World Championship Wrestling. Archived from the original on 2000-11-10. สืบค้นเมื่อ 2015-08-13. ↑ Royal Duncan & Gary Will (2000). Wrestling Title Histories (4th ed.). Archeus Communications. p. 68. ISBN 0-9698161-5-4. ↑ Royal Duncan & Gary Will (2000). Wrestling Title Histories (4th ed.). Archeus Communications. p. 50. ISBN 0-9698161-5-4. ↑ "National Wrestling League Heavyweight Champion History". National Wrestling League. Archived from the original on 2008-06-26. สืบค้นเมื่อ 2015-08-10. ↑ Royal Duncan & Gary Will (2000). Wrestling Title Histories (4th ed.). Archeus Communications. p. 52. ISBN 0-9698161-5-4. ↑ "NWA Texas Heavyweight Championship". Lone Star Championship Wrestling. สืบค้นเมื่อ 2015-08-12. ↑ "Texas Tag Team Title History". Lone Star Championship Wrestling. สืบค้นเมื่อ 2015-08-12. ↑ "NWA Tri-State Heavyweight Title (Oklahoma)". Wrestling-Titles.com. Puroresu Dojo. 2003. ↑ "NWA Tri-State Heavyweight Title (W. Virginia, Ohio, & Kentucky)". Wrestling-Titles.com. Puroresu Dojo. 2003. ↑ "New England Pro Wrestling Hall of Fame". Facebook. New England Pro Wrestling Hall of Fame. 2012-05-12. สืบค้นเมื่อ 2015-08-12. The class of 2010 for the New England pro wrestling Hall of Fame included Jimmy "Superfly" Snuka, "Living Legend" Larry Zbyszko, The late Rocko Rock and Johnny Grunge (Public Enemy), Sonny Goodspeed, Kenny Casanova, Paul Richard, Tony Ulysses, Bad Boy Billy Black, Maverick Wild, Dr. Heresy, The late Mr.Biggs, John Rambo, Bull Montana, The late Georgiann Makropoulos, "The Duke of Dorchester" Pete Doherty, "Dangerous" Danny Davis, Angelo Savoldi, Mario Savoldi, "Jumpin" Joe Savoldi and Tommy Savoldi. ↑ Snuka, Jimmy (2012). Superfly: The Jimmy Snuka Story. Triumph. p. 62. ISBN 1617499803. ↑ "NWA Pacific Northwest Tag Team Title". Wrestling-Titles.com. Puroresu Dojo. 2003. ↑ Cawthon, Graham (2013). The History of Professional Wrestling: The Results WWF 1963–1989. CreateSpace Independent Publishing Platform. p. 369. ISBN 978-1-4928-2597-5. ↑ 30.0 30.1 "Achievement Awards: Past Winners". Pro Wrestling Illustrated. London Publishing Co.: 85 March 1996. ISSN 1043-7576. ↑ "Achievement Awards: Past Winners". Pro Wrestling Illustrated. London Publishing Co.: 87 March 1996. ISSN 1043-7576. ↑ Oliver, Greg. "Jimmy "Superfly" Snuka". The Professional Wrestling Hall of Fame and Museum. สืบค้นเมื่อ August 6, 2015. ↑ Royal Duncan & Gary Will (2000). Wrestling Title Histories (4th ed.). Archeus Communications. p. 46. ISBN 0-9698161-5-4. ↑ "USA Pro/UXW New York Heavyweight Title". Wrestling-Titles.com. Puroresu Dojo. 2003. ↑ 36.0 36.1 Royal Duncan & Gary Will (2000). Wrestling Title Histories (4th ed.). Archeus Communications. p. 65. ISBN 0-9698161-5-4. ↑ 37.0 37.1 ""Superfly" Jimmy Snuka Soars into the TWA on Apr 11th". Tri-State Wrestling Alliance. สืบค้นเมื่อ 2015-08-10. ↑ 38.0 38.1 Meltzer, Dave (January 22, 1996). "Jan. 22, 1996 Wrestling Observer Newsletter: Results of the 1995 Observer Newsletter Awards, 1995 Record Book, tons more". Wrestling Observer Newsletter. หน้านี้แก้ไขล่าสุดเมื่อวันที่ 1 ธันวาคม 2561 เวลา 21:22 น.